Dublin is situated midway along the east coast of Ireland, with the Irish Sea between it and England and Wales. Dublin is the capital of Ireland and is the largest city by some distance in Ireland. With a fascinating history that goes back more than 1,000 years, Dublin is a hot point of culture, history and entertainment. While Dublin is usually the subject of short trips, there is more than enough to keep you busy here for weeks on end. Be forewarned that Dublin is not famous for its climate and you will need to pack in case of rain. Most people visiting Dublin will be coming from Dublin Airport. The airport is situated ten kilometres to the north of Dublin City Centre. There are numerous bus services operating between the airport and the city centre. Express buses are available from €6 which makes use of the Port Tunnel to get to the city centre as quickly as possible while indirect services will cost in the region of €2.50. Despite the recent financial collapse, Dublin is one of the most popular tourist destinations in Europe. It can be described as a vibrant city that is steeped in history. There are few cities in the world that can match Dublin as a historical holiday destination. Over the last two decades, it has grown a reputation as being a destination for those who like to party. The city has a huge amount of pubs to offer, varying from the quaint to the history to present day. Because of the number of attractions on offer, it is advised that you plan your trip before arriving to ensure you get the most out of your visit. 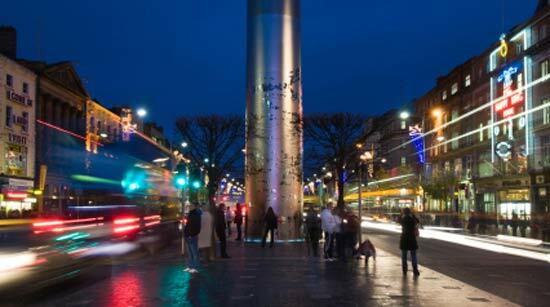 O’Connell Street is the main street of Dublin and is home to the Spire, a 120 metre tall stainless steel monument that reflects the changing light within the city beautifully. From O’Connell Street, Henry Street is a pedestrian shopping street while historic shops such as Easons and Arnotts are close by. On the South side of the city, Grafton Street is the premier street and is also a pedistrianised shopping street. Between the two streets is Temple Bar, the cultural and nightlife capital of the city with vintage shops, street art and interesting restaurants on offer. If you want to squash as much as possible into a short period of time, one of the best ways to see the city is by a tour. There are walking tours, several bus tours and even a Viking Splash tour which uses an amphibious vehicle from World War II to drive around the city and even enter the River Liffey. The Guinness Storehouse has been the most popular tourist destination in Ireland for the last number of years. 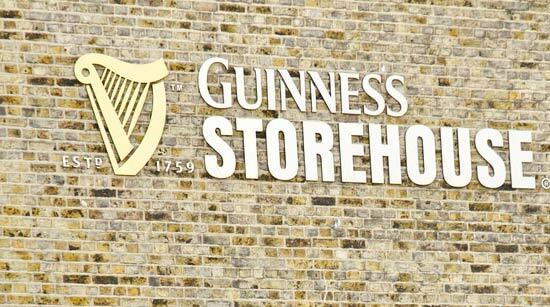 The storehouse has been transformed from a brewery into a museum dedicated to all things Guinness. At the very top floor of the storehouse is the Gravity Bar where all visitors can get a complimentary pint of Guinness and enjoy almost 360 degree views over Dublin. 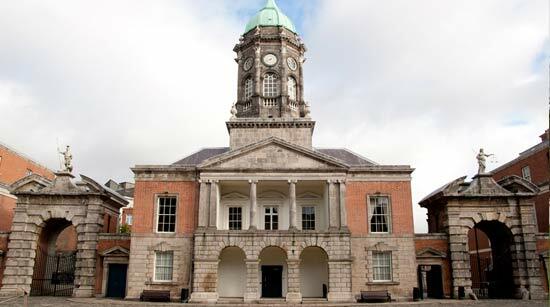 One of the most beautiful aspects of Dublin is the Georgian architecture, although expect to also see medieval and modern architecture also. One of Dublin’s most interesting aspects is its literary history, with James Joyce, Brendan Behan, Samuel Becket, Bram Stocker, Jonathon Swift, Oscar Wilde and Patrick Kavanagh having all lived in and written about Dublin. Such is Dublin’s literary heritage, it is actually now a UNESCO City of Literature. The Dublin Literary pub crawl is a popular tourist attraction that combines the interesting literary history of Ireland with a pub crawl. Along the way, actors will re-enact scenes from famous works by Irish authors such as Joyce, Behan and Beckett. Today, the literary culture of Dublin is highly developed for the tourist market, with James Joyce tours, famous literary pubs and various walking tours that also explore the literary history of Dublin on offer. The Dublin Writers’ Museum is as good a place as any to start if you want to start exploring literary history. The Museum contains works of history importance dating from the modern day to over 300 years old. These include letters, manuscripts and lots of other memorabilia. 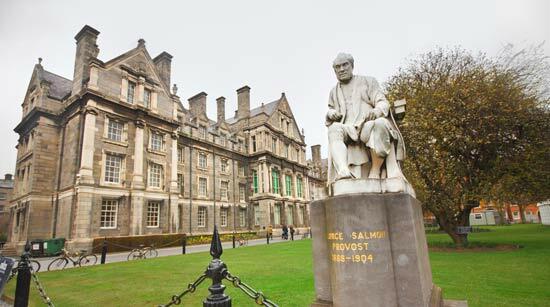 When visiting Dublin City Centre, Trinity College is practically unavoidable. It sits at the bottom of Grafton Street with the Old Library in particular being of interest. The Old Library houses some true literary treasures, chief of which is the Book of Kells. The Book of Kells is a 9th Century illuminated manuscript that was brought to Trinity College for safe keeping during the 17th Century, where it has remained ever since. It has in fact for a period been buried in the earth to protect against theft by Viking raiders. Seeing it really is an awe inspiring and moving experience, letting you into an enigmatic era of Ireland’s history. Another fascinating attraction in Dublin City Centre is the Chester Beatty library. Chester Beatty made his fortune in copper mines, and then turned his attention towards his real passion, rare books and Asian art. His collection encompasses manuscripts and artworks related to Christianity, Islam, Buddhism and other religions. In 1956 when he died, he bequeathed his entire library to the city of Dublin. If you want to get out of Dublin, and explore any of the wonderful attractions there is no better way than to rent a car. CARHIRE.ie offer a car rental Dublin Airport and City Centre rental service which will allow you quickly collect your cheap car rental and get on your way. There are some wonderful day trips from Dublin which are worth looking into such as Glendalough, Trim Castle, Newgrange and many more locations. If during your visit to Dublin you want to get some fresh air, Howth is highly recommended. Howth is a seaside village connected to Dublin City Centre by the DART and Dublin Bus, located just 10km from Dublin City Centre. There are fish restaurants pubs and a beautiful harbour along the waterfront while a number of looped hiking trails offer the chance to explore the coastline and hills on the Howth peninsula. Some of the views that can be enjoyed when completing the hiking trails are nothing short of stunning. The national transport museum is also located in Howth and provides a fascinating insight into how public transport in Dublin has changed over the last 100 years. If you fancy more walking trails or even a bigger challenge, the Wicklow Mountains offers a number of highly developed and beautiful walking trails. These trails are well signposted and the level of difficulty for each is clearly indicated before you start. If on the other hand you would like to play golf, Dublin is home to a number of very fine golf courses with some of the finest links golf courses in the world only a short drive away. There are more than 40 golf courses within Dublin City itself which will give you some idea of the range of courses on offer. When in Dublin, be sure to keep an eye out for any of the several castles located within the city. Dublin Castle, located in the heart of Dublin City is a beautiful castle that was the seat of British rule in Ireland until 1922 and today plays an important role as a host for international governmental conferences. Swords Castle, located just north of Dublin Airport was first built around 1200 as the residence of the Archbishop of Dublin. Today, the castle is almost completely restored and is open to the public by appointment between Monday and Friday. Whether you are interested in sport, the outdoors, history, culture or architecture, Dublin is one of the best holiday destinations in the world. Look no further than car hire Dublin Airport for the best car rental deals. We offer a cheap car rental service all year round with a fantastic service. If renting a car from Dublin Airport, be aware that there are two terminals, Terminal 1 and Terminal 2. Terminal 1 is the existing terminal at Dublin Airport while Terminal 2 is a state of the art modern airport terminal, served mainly by upmarket airlines and flights to and from the United States. The airport, through its Loop shopping centre is a major attraction, and promises to always beat down town prices.